Clean potatoes and cut them by half. Boil potatoes into salted water for about 30 minutes (They’re ready when a knife enters easily). Then, you’ll take them off water and let them chill. Meanwhile, peel and slice onions. Melt butter in a frying pan. Add sliced onions. When onions are translucent, add bacon dices and leave over medium heat for 5 more minutes stirring often. Preheat oven to 460° F (240° C / Th 8). Rinse and dry small chives. Chop them. In a bowl, combine creme fraiche with wine and small chives. Season with salt and pepper. Grease an ovenproof dish. Start by arranging a layer of potato slices at the bottom of the dish. Top with bacon dices and onion, then spread the cream mixture on top. Repeat with another layer of everything. Grate Reblochon’s lightly with a knife. (Don’t take it off! Just grate what’s coming off easily). Slice Reblochon cheese into 2 thinner circles, each one having rind on one side and inside cheese on the other side. 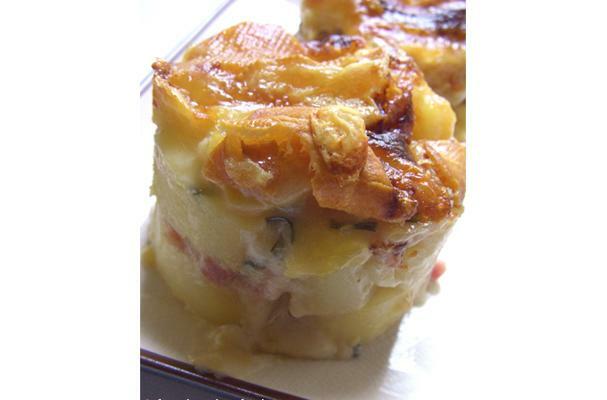 Place both circles on top of the potato layers with the rind side up and bake in oven for 10 to 15 minutes or until crust is golden and cheese sauce is simmering. Serve immediately with green lettuce and vinaigrette.